Conservative Congressional leaders have had bicycle and pedestrian projects in their cross hairs for years. This has led to some serious policy concerns, such as a Republican Bill to reauthorize the transportation trust fund that has no bicycle or pedestrian funds. And less serious ones, such as online polls designed to create populist anger against green transportation spending. Cantor's reasons wanting cuts to bike share. Just last year, Republican House Majority Leader Eric Cantor proposed eliminating the federal Safe Routes to Schools programs in his YouCut program, where people vote on their least favorite projects on a special website. While Safe Routes to Schools didn’t “win” that election, Cantor is now proposing to eliminate federal bike share subsidies. Even if the federal government eliminated funding for bicycle and pedestrian programs altogether, it wouldn’t do much of anything to reduce the federal deficit. Note in Cantor’s proposal there are hard figures for savings if the grants to Worstel Wool Manufacturers or a scholarship and research program to promote green technologies were eliminated. That’s because there’s no line item in the federal government for “bike share” programs, which is probably why bicycle and pedestrian projects are blamed for the bankruptcy of the federal transportation trust fund. In the 2011 fiscal year the federal government granted $53 billion in grants through the transit and highway trust funds. Less than 2% of that was spent on bicycle and pedestrian programs, and barely any of that was spent on bike share programs. The expansion of Washington D.C.’s program was the big bike share expenditure at $1.9 million. I suppose it could be worse. At Cantor he didn’t refer to bike sharing as a communist plot. Rep. Cantor is House Majority Leader, not Majority Whip. I know I will get slammed for this, but I have to say that Safe Routes to School seems like a superfluous program to me. Since learning about the program on Streetsblog, I have paid more attention to it in the news. In the 1960s as a 7year old I walked to and from my San Francisco school — about 7 blocks and along busy Ocean Avenue, crossing at stoplight at a simpler intersection. We did not need teachers guiding us, but we did need our parents or sibs to show us the way for a couple of weeks (or more, hard to remember from that age). Can’t the Jackson school do the same — working with parents to re-do how children come and go from school? Would that take more than a few meetings and some letters sent home? How about a couple of older students working as unpaid but much honored crossing guards? (As a 6th grader, I loved my red jacket, yellow helmet, and stop sign I wielded for the smaller kids.) In other words, why do we need a federally funded program for such a basic, local need that has in the past been met easily by local intelligence? Then I noticed that in Alameda County the Safe Routes program is being held up temporarily by some Caltrans internal issues. What struck me, however, was its pricetag at $1.5 million and the host of family workshops conducted by all sorts of non-profits on bicycling, movement, etc. “What a lot of hooey!” I said to myself. And what a lot of bucks spent when walking to a nearby school is such a simple thing to teach a child. I apologize for the long-winded exposition here. My point is that we need to focus all our transportation dollars where they are most needed. Safe Routes to Schools cost pennies (or 1.5 million in Alameda!) in comparison to mass transit operational expenses, but it still costs. And it seems kind of inane to me. 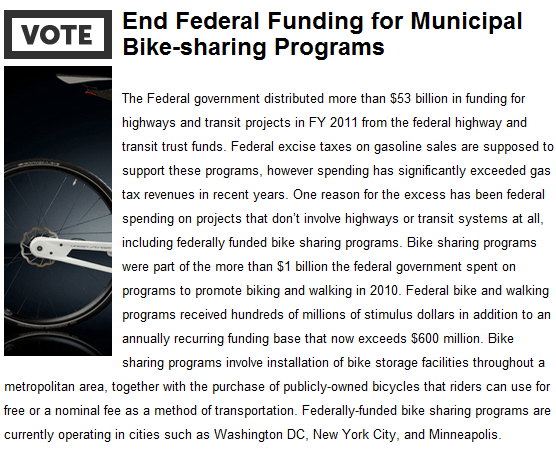 I agree: federal funding for local cycling programs is inappropriate. But I think federal funding for any local transportation purposes is inappropriate. WRT bike share: Google can’t even keep track of the bikes they provide for their employees… and government run bike share program is going to last at the absolute a month before the bikes are lost and damaged. It’s just flushing money down the toilet for appearances. Safe Routes to Schools (SR2S) have both infrastructure and non-infrastructure components. Above you generally seem to be discussing the non-infrastructure programs that are often referred to as encouragement, enforcement, and education activities. Infrastructure grants fund engineering improvements like new sidewalks, traffic control devices, striping, signage, etc. Up until I had a driver’s license I also walked or biked to school. I disagree with you because all of the elements above (not to exclude evaluation) are important aspects of creating the transportation system we want to see and some of those elements we had the good fortune of experiencing personally. They all complement each other and many of them involve drivers. It seems we agree that walking and biking to school are desirable. Historically the proportion of children who walk and bike to school has been declining. If spending 4,500 dollars in Jackson, Michigan helps educate people on walking to school and how they too can participate, I’m for it and feel other communities should have a similar benefit. This is such a small amount of $ in the overall scheme of things and is somewhere I would rather see investments than where we have many expenditures such as wasteful military spending and salaries of elected officials. djconnel: I’m sure you’ll be surprised to hear me say I disagree with you too. What I’d like to point out is that federal funding for local cycling programs can support a number of programs from infrastructure to education to enforcement. While I disagree with your dismissal of bike sharing (pretty sure it has been in effect for more than 1 month already), even if I did take that as a given, that is but one aspect of cycling programs that I can get behind. I can only describe Cantor’s proposal as lacking vision, sense, or a long-term perspective. Oh, and if you are looking for a reason to invest this money, I would argue that since vehicle collisions are the leading cause of death among 15-20 year olds and that accidents are probably a significant cause of death or injury for younger populations, better overall education and enforcement is sorely needed. Don’t have readily available statistics, but there are some here: http://www.sadd.org/stats.htm. Essentially this is a leading threat to young populations and limits the transportation options for many and in my opinion merits federal funding from a variety of perspectives, one of which should be SR2S. I think the bottom line is we need safer streets and its a shame that relying on parents and other orgs hasn’t gotten us where we need to be, so I think this helps. Was Eric Cantor Forced to Ride This Bike?